One of the most important steps in the meth recovery process is making the decision to quit. With the proper support, one can succeed with recovery and lead a life that is free from drugs. In this post, we are going to discuss what to expect from meth detox and treatment. Education is a powerful tool, and the more you know, the more you can be prepared for the journey you or a loved one will take. What Is Meth Withdrawal Like? A detox program starts an individual on the withdrawal process. Meth withdrawal is similar to any withdrawal from other stimulants, and it includes two stages. Issues with thinking and memory. There is also something called post-acute withdrawal syndrome (PAWS) that some meth users experience, which can last for months. Some drugs, such as alcohol or benzodiazepines, can have such severe withdrawal symptoms, and they can be life-threatening. As uncomfortable as it is to withdrawal from meth, it is rarely dangerous. However, some people experience psychosis from the withdrawal symptoms and believe that they could hurt themselves or others. In order to have the best chances for a complete recovery, it’s best to receive detox from an experienced meth rehab. Not only does individualized care increase the odds of success, but also the unpleasant symptoms from the withdrawal process can be successfully managed. Treatment facilities have access to a wide variety of alternative and conventional medicines that ease symptoms and keep clients comfortable. 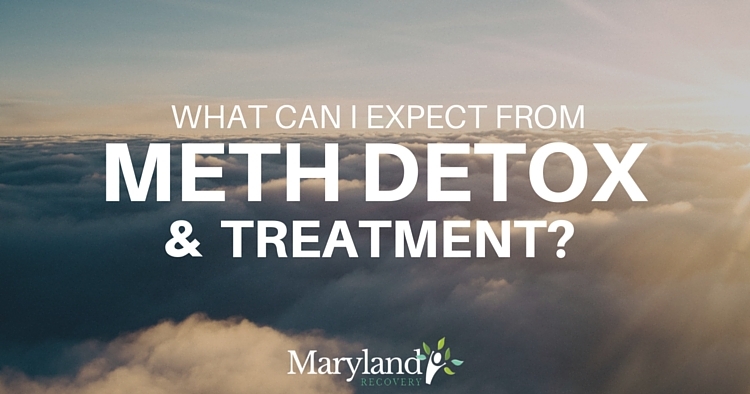 Maryland Recovery offers a comprehensive treatment program for meth addicts. It includes three phases of care: assessment, detox and treatment. Meth addicts are screened before entering drug treatment. Our program is especially unique because it combines aspects from both an inpatient and outpatient program. While we have seen great things from this setup, we want to make sure that it is the right fit for the individual. The second stage is medical detox. Our goal is to make our clients as comfortable as possible. While there are no medications for meth addiction that are approved by the FDA, alternative treatments are available to help with withdrawal symptoms. We also make sure that our patients suffer from no major medical problems. The last stage is the treatment process. Clients receive emotional support and work through underlying problems in therapy and counseling. They also learn important tools and skills that will help them make good choices and deal with cravings. As successful as meth detox and treatment can be, a person needs more than 30 to 90 days in treatment to heal from their addiction. Aftercare is a strong component for long-term sobriety. Maryland Recovery does not believe in sending clients out in the real world without any direction. We teach our clients essential life skills and relapse prevention skills. We can also assist with legal issues, ongoing family problems and the start of a 12-step program. These are just a few of the ways we remain committed to our clients’ journeys. If you or a loved one is ready to quit using meth, call Maryland Recovery today. Our unique approach to meth addiction treatment has had positive results for many individuals. This entry was posted in Rehab Information and tagged Detox, Intensive Outpatient (IOP) Treatment, Residential Outpatient Treatment on July 29, 2016 by mdrecovery.